Co-sleeping is practiced between parents and children all over the world. Parents who love to co-sleep with their newborns, toddlers, and older children, argue that it keeps them more connected to their kiddos. We understand that co-sleeping can be a controversial topic for many people but it can also yield some really funny and adorable results. 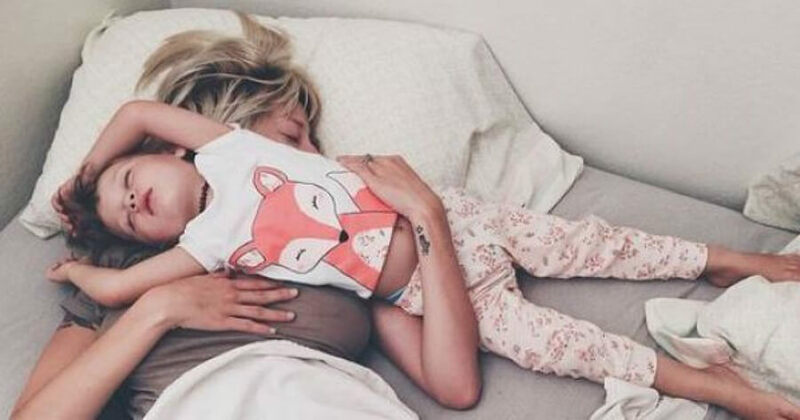 From parents who can’t figure out their child’s sleep time motives to moms and dads who are totally over the practice, we’ve found some really funny and unexpected co-sleeping situations. Hey dad, there’s something in your nose… but more on that in a minute. When Ilana held a contest in Mommy Shorts called “Get Out of My Bed, Please,” her followers certainly delivered. She shared this photo as one of her favorites, knowing all too well that parents out there can relate. 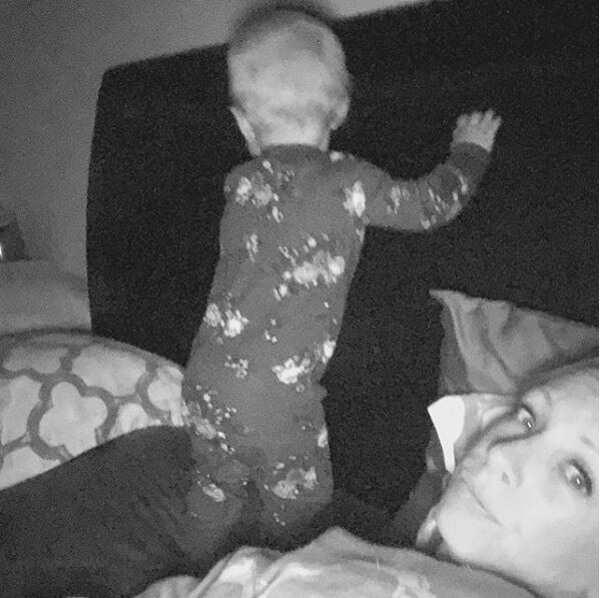 As you can see, this little boy somehow managed to move all the way to the top of the bed and snuggle up against the headboard. Unfortunately for mom, this meant that she became part of his new resting space and not only did he stick on of his feet in her pillows, but he also let one of his feet hang over mom’s face! That’d be something to wake up to. And this is just one of the ways you can wake up with a foot in your face! Tiff Delancy, or @namastetiff on Instagram, shared this lovely snap of her and her daughter in 2015. Somehow, kids always end up on top of you when you let them snuggle up with you in bed. It looks as if Tiff’s daughter woke up in the middle of the night to do a yoga routine and get her stretches in. It seems that she fell asleep mid-routine and landed on Mom’s chest as a result. We’re sure that it’s an annoying consequence of co-sleeping for sure, but one thing is always certain: despite the annoyance, the love grows ten times stronger! This baby somehow squiggled all the way across Dad’s face! We hope he can breathe under there! 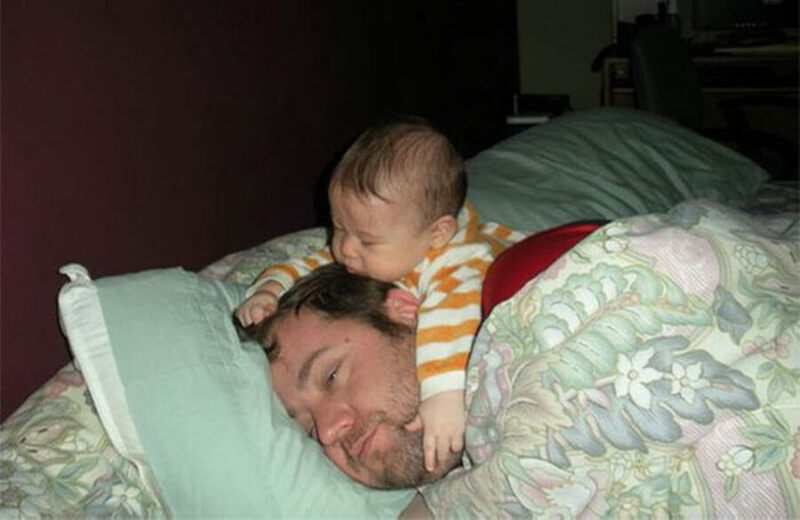 This dad probably woke up suffocating thinking that someone was trying to kill him, but only realized that his baby has chosen to sleep right on his face. 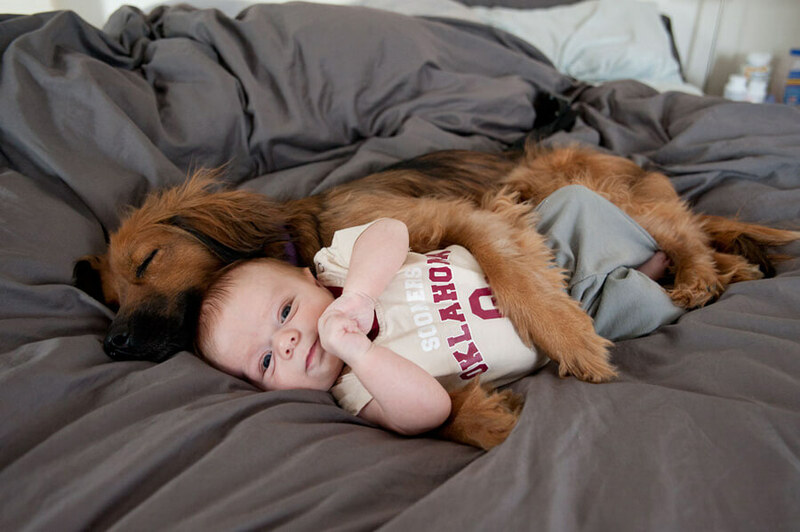 This takes closeness to a whole new level, but we can’t help but wonder how this is possibly comfortable for Baby? Perhaps Baby was thinking ahead and putting his diaper on Dad’s face so that he remembers that Baby needs to be changed! If that’s the case then Dad probably woke up to a wonderfully-smelling surprise. If you’re going to try co-sleeping, expect to not get any actual sleeping done on nights when your children are especially restless. 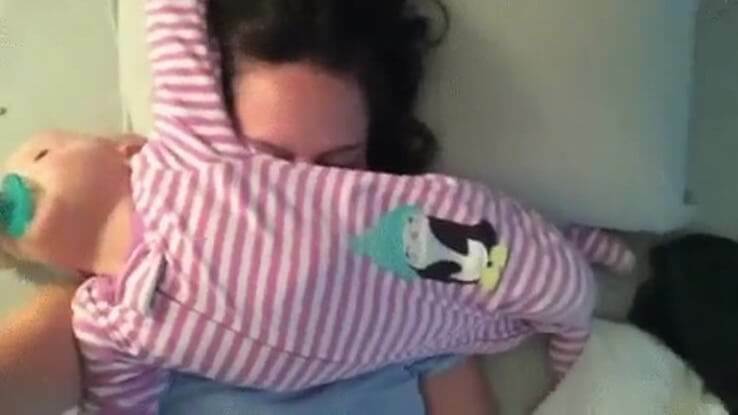 Esther Anderson of the online blog Story of This Life shared a video with her followers in 2014 to show that sleeping with a baby is like having a human alarm clock. As Esther tries to sleep—or at least pretend to sleep—her baby is fully awake, poking, prodding, and crawling all over mommy’s face. It does give mom and baby time to be close, but sometimes, all mom wants is a little sleep. Looks like Dad is passed out after cuddling his baby girl. We did mention earlier that when parents let their kids co-sleep with them, the kids’ feet always somehow end up in the parents’ face. In this case, Baby has her foot right on Dad’s face and it looks as if she’s trying to put her tiny toes into Dad’s nostrils! See? Co-sleeping has some adorable results and luckily, Baby’s feet don’t really have the ability to smell yet. Dad is in a deep sleep and probably doesn’t realize any of this is going on, until he sneezes and suddenly sends Baby into a crying fit of rage from being woken up. This dad seems to be taking it easy, but soon you’ll see one dad who wishes he had the bed to himself! When you co-sleep with your baby, sometimes the bigger challenge is actually getting them to fall asleep. Instagram user @meganzernicke_fit knows this situation all too well, having captioned this photo “It might be time to contain her in a crib.” Perhaps being in a crib will prove less distracting when it is time to hit the hay. Megan doesn’t look too pleased that her baby girl is wide awake at bedtime. After all, we can bet that Megan was waiting for Baby to fall asleep so that she could get to sleep too! You Have Other Pillows But This Is What You Prefer? @gemmajhenry on Instagram shared this pic with the caption, “The ‘am I being buried alive?’ dream, brought to me by a restless wriggly Willy.” We can imagine this mom sleeping peacefully when all of a sudden, her dreams take a dark turn as her breathing is stifled. She is finally woken up to realize that her son has squiggled his way on top of her face. 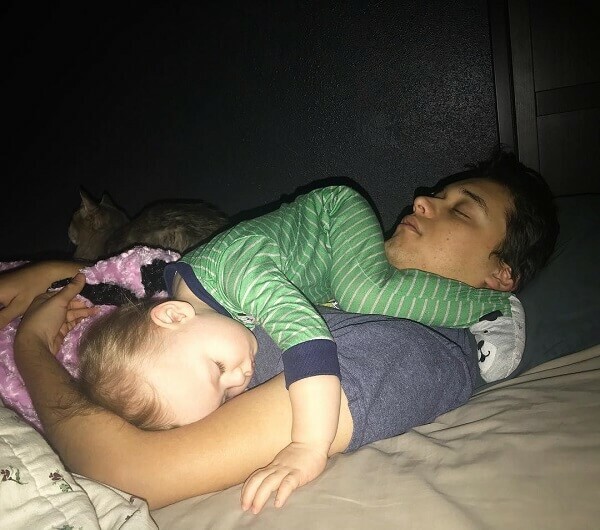 This would be a variation of what howtobeadad.com calls “The Neck Scarf” in their collection of Baby Sleep Positions. This is definitely one way to keep warm and cozy at night if you don’t mind having trouble breathing throughout. In case you were wondering, howtobeadad.com calls this one “The Roundhouse Kick.” Notice how Baby is sprawled out and has one foot directly on Mom’s face! Super comfy. 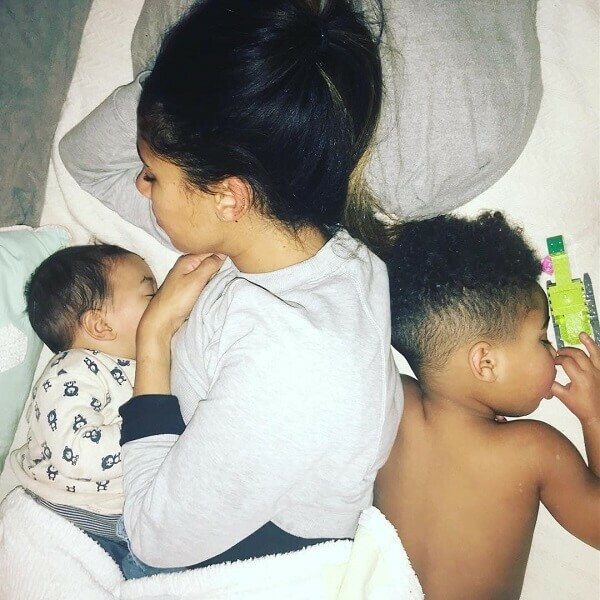 Vanessa is the owner of @anabelle_and_zavier on Instagram and shared this snap saying, “Shoutout to all you co sleeping parents. I don’t know how you do it!! Haha Zavier woke up a few hours early this morning and I sooo wasn’t ready to be awake and he wanted cuddles so I brought him into my bed. Woke up a few hours later like this.” Let’s just hope Vanessa still managed to get a sufficient amount of sleep. It looks like Dad is unbothered here, but you’ll probably relate more to the sleepless father coming up! Most parents are aware of how difficult it is to get a baby to fall asleep in their cribs. It’s especially heartbreaking because most of the time they know that Baby wants nothing more than to be next to Mommy or Daddy. Nunzio Raso of YouTube shared his struggles in 2009 when he tried to get his then-10-month-old daughter to sleep in her crib saying, “I decided that the only way that could keep this baby from crying is doing the unthinkable!” We wouldn’t be surprised if Raso ended up falling asleep in the crib himself! Sometimes desperate times call for desperate measures. @mvemother shared this photo on Instagram saying, “Please don’t tell my husband I posted this! It was too perfect not to share! 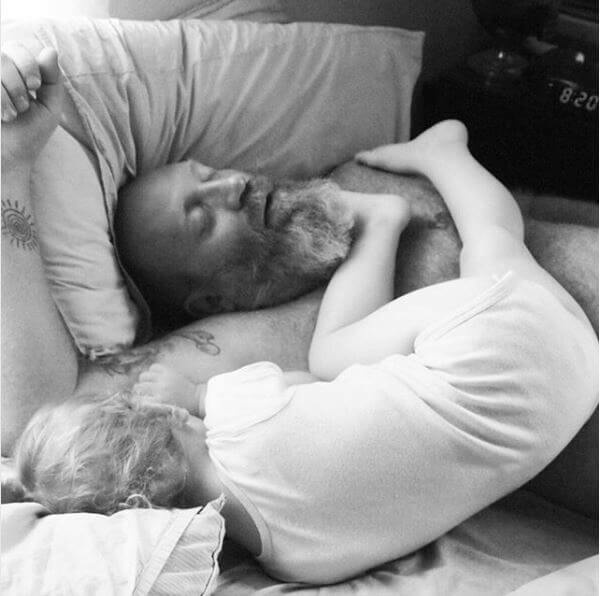 When I took this picture I was afraid the shutter noise was going to do what a 30 lb toddler, sprawled across the chest, apparently couldn’t…and that is, wake him up!” This Instagram user was certainly right because the last thing you’d want to do over waking your husband would be to wake your toddler. We couldn’t help but notice, however, that this looks like a setup for the perfect painting from the Renaissance, with exasperated expressions and flailing bodies. 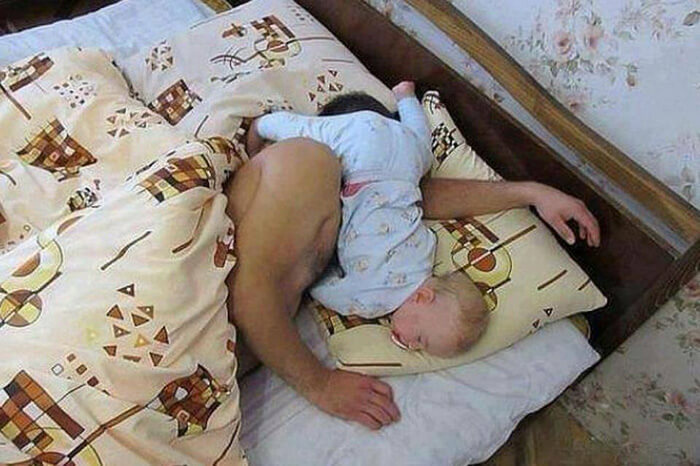 This dad looks like he’s trying to have the best sleep ever. He knew that having a baby meant a lot of sleepless nights, so here he is, trying not to complain about his current situation. Mom probably thinks it’s sweet that their baby has fallen asleep spooning his Dad’s head, but Dad probably just wishes that he can have an uninterrupted slumber. Don’t worry, dad, there are worse situations you can be in right now. If anything, that squishy baby is like another pillow supporting your head! Just be careful not to lay over on top of him! 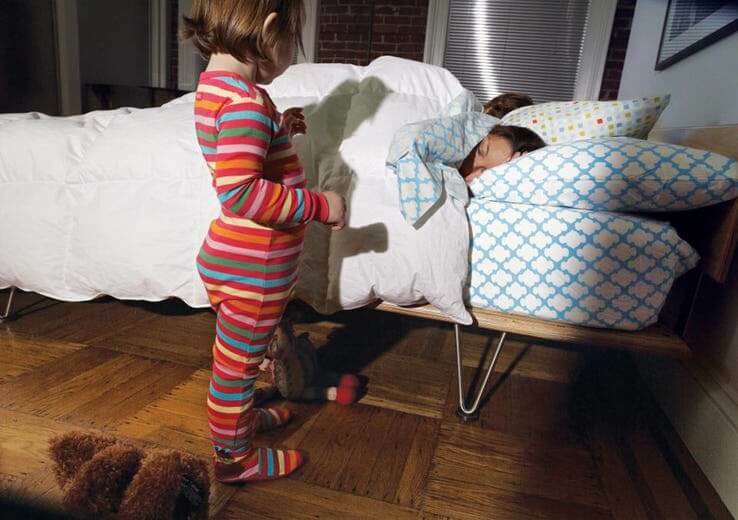 Do Kids Take Joy In Ruining Your Sleep? This is Emily Barlett of the blog Holistic Squid sleeping with her son, or at least, sleeping next to her son, who is happily awake. 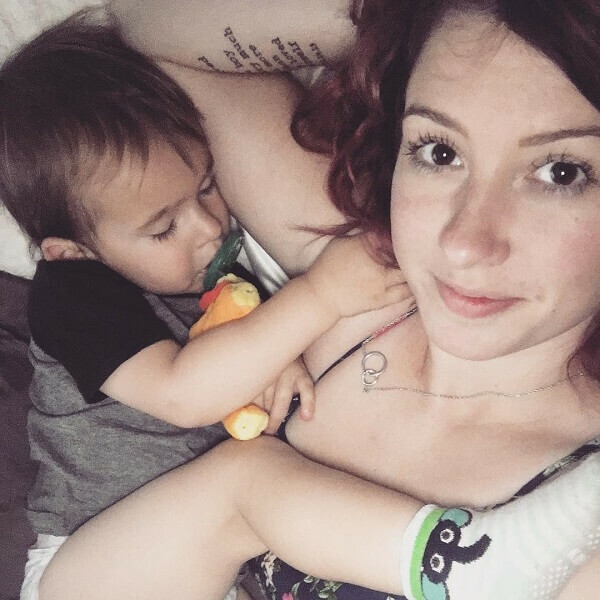 Not all parents advocate co-sleeping, which is a part of “attachment-style parenting.” Bartlett says that with her first child, she and her husband practiced attachment parenting but that it sort of ruined their lives. “Not only had attachment parenting led me down a path to crazed sleep deprivation and chronic back pain, but I spend most of those two years feeling guilty about my failures as a mother,” Bartlett writes. Luckily, she and her husband eventually found that enacting a sleep schedule early on is a good way to avoid co-sleeping struggles. 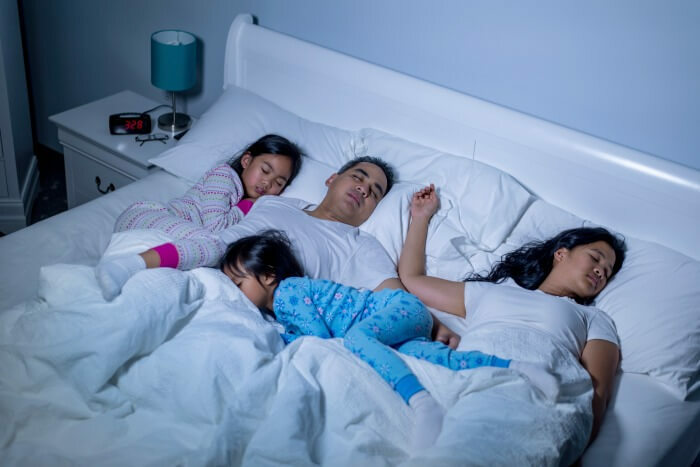 When co-sleeping does seem to work out and both Mom and child are sound asleep, that doesn’t mean that their immune to hijinks at the hands of other family members around the house. This mom fell asleep in the living room and one Reddit user posted this image saying, “My niece thought my mom needed this sticker while she was sleeping.” One thing is for sure, this mom knows now to always sleep with one eye open! 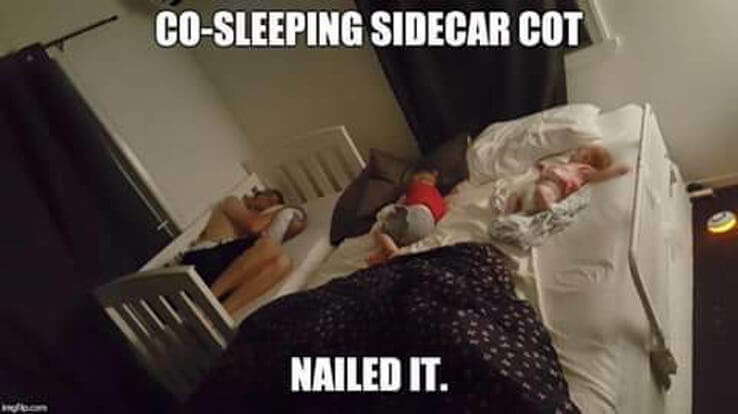 As hilarious as this is, it’s good to see that they’re both getting sleep, because as we already know, co-sleeping usually comes with the caveat of no sleep at all. How Do People So Small Take Up So Much Space? Think little kids aren’t all that talented? Think again! You have to possess a lot of talent to take up so much space when you’re still so much. Just take a look at these young siblings. Even after mom and dad pushed another mattress up again their own, their kids found a way to still make this sleeping situation only big enough for two people. It’s pretty impressive really! Now where are mom and dad going to sleep? If you think these siblings are impressive, wait until you see the next little girl. If you’re a parent, you know that getting your kids to go to sleep isn’t always an easy thing to do. When they do finally go to sleep, that last thing you want to do is wake them up. So if your little one has taken a liking to sleeping in your bed and grab it first, you might just be out of luck. 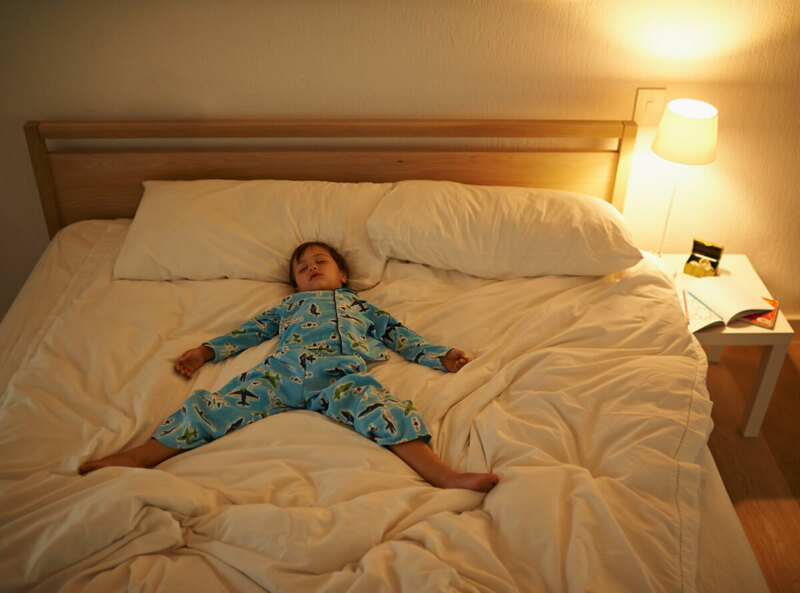 It’s situations like this that truly baffle us though…how is it possible that this teeny, tiny human can manage to take up nearly 80 percent of this bed which is designed to comfortably sleep multiple people?! But of course, we would never actually do that for fear of waking up our sleeping babies! 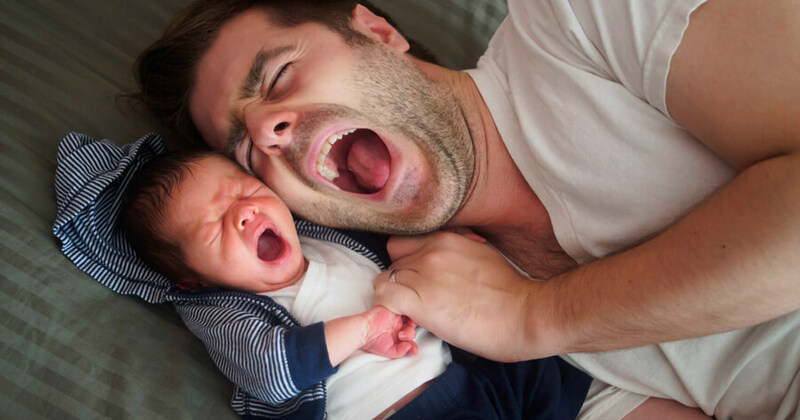 While toddlers and older kids can put you in an uncomfortable sleeping position, newborns can make you lose sleep simply because of their crying! In this case, the only thing for you to do is to comfort them until they do fall asleep and luckily they’re still small enough so that they don’t move around so much and end up kicking you in the face. We’re sure by the time they’re that old, you’ll have already decided that they’re not sleeping in your bed. 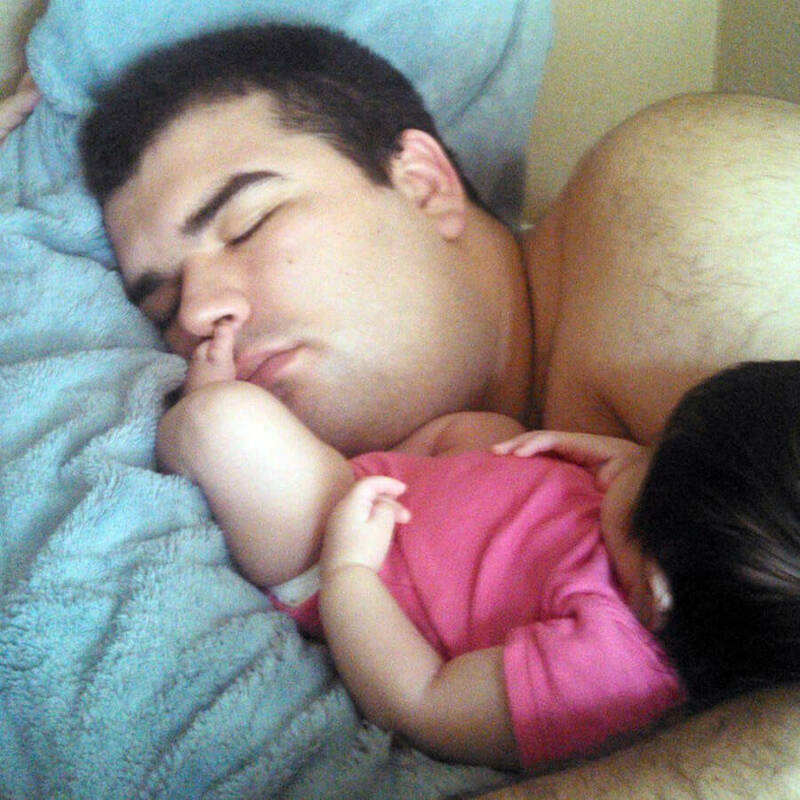 This father appears to be sleeping peacefully with his baby daughter, but wait — something looks a little off here. 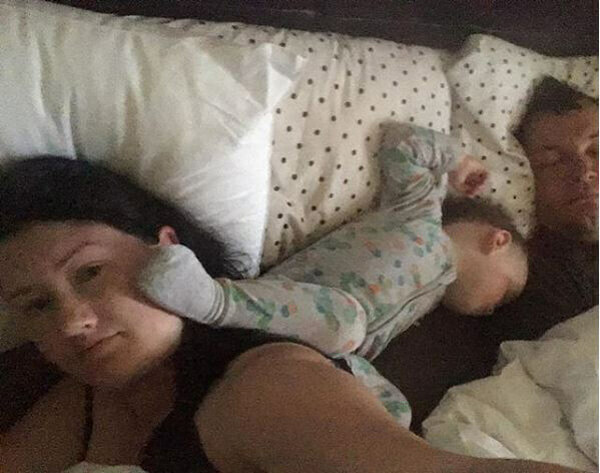 Co-sleeping can bring your closer to your baby and this hilarious picture shows us just how close you can possibly get! 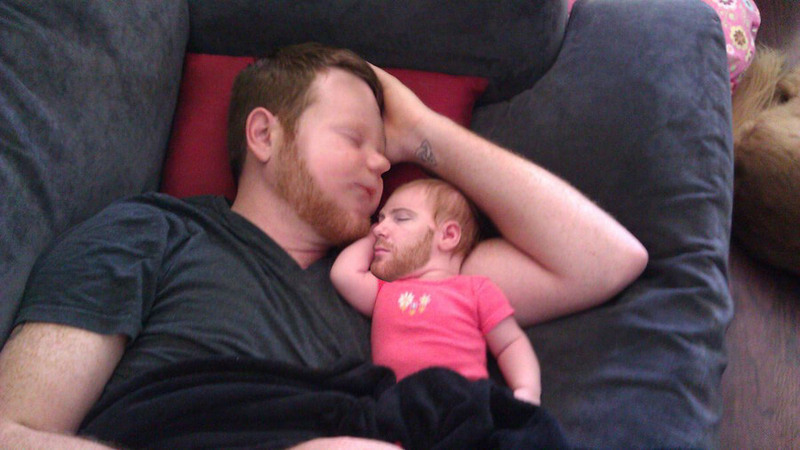 Whoever took this photo of Dad and Baby found the perfect opportunity for a face swap. 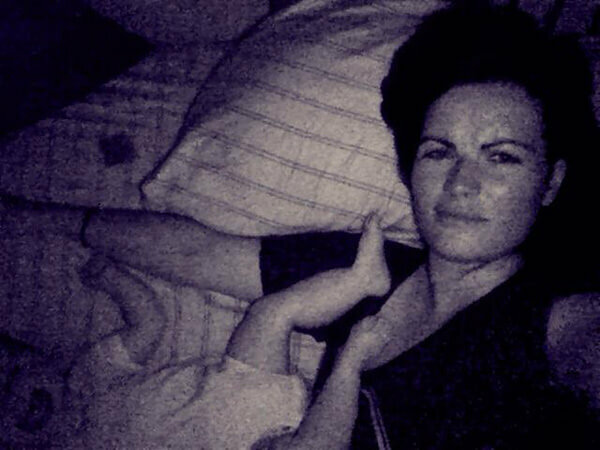 Imagine being the Mom in this situation, co-sleeping with your husband and baby and you wake up to this! It would possibly be more frightening than waking up with a foot or a diaper on your face! Wouldn’t you agree? There’s no story accompanying this photo but it serves as the perfect opportunity to remind parents that little tiny children take up a lot of space. We don’t really understand the physics behind how they do it but even a 30-inch tall child can take up 90% of a queen or king-sized bed. If you have ever co-slept with your children you are aware how quickly your mattress shrinks and you end up holding onto the end of your mattress for dear life. Co-sleeping can be very comforting for mother, father, and child or it can be a circus-inspired balancing act that lasts all night long. We’re not joking when we say your child will literally use your face as a diving board or landing pad for their crazy swan dives. This adorable little child doesn’t have a care in the world. Mom, on the other hand, is left lying in quiet despair as she realized sleep will elude her for the next 18 years. On a positive note, this little child is showing that they are growing stronger every day. Sometimes as a parent you have to look at the empty glass as half full or you’ll lose your mind. Sorry, mom but baby won this round. I don’t know what’s worse, waking up to a child’s foot shoved halfway up your nose or realizing someone is standing next to your bed, staring at you, in silence. Once you become a parent it becomes quickly apparent that children are little spies who always want to know what you’re doing, even if you’re sleeping silently in your bed. The phrase, “mom, mom, mom, mom, mom, mom,” will become one of your least favorite things to hear while sleeping soundly in your own bed. The bed you can hope is that your child grows tired of this game and goes into the living room. Although, that might lead to items being broken so you can’t really win here. Bring the crib into the bedroom she said, it will be more comfortable for everyone she said. This dad will probably argue that he didn’t give up on co-sleeping, he just found an inventive way to make more room for his growing family. After a few years of this dad will have back and neck problems but will have slept more than many parents with two young children. Sometimes as a parent you just have to pick your battles and hope the final result is something everyone can live with over the long run. If you have a small child in bed with you this is how the night still end. 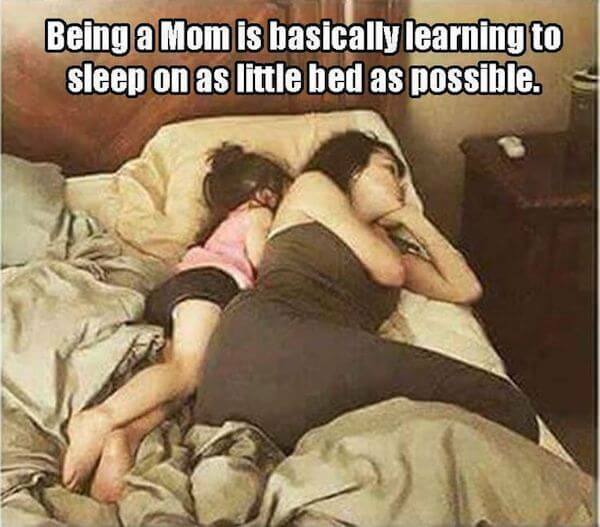 Children have the ability to grow invisible limbs that push both mom and dad to the very edge of the bed. You can move them 20 times in the middle of the night and their magical baby powers will put you back in this same position when you finally wake up. Our advice is to just learn how to sleep on the very edge of the bed because that’s where you’ll spend the next year or two of your nighttime life. Even if co-sleeping is not a part of your nightly routine, be prepared for your children to jump into bed and take over. You claim your bed is only big enough for mom and dad? Kids will find a way. You think they are too old to sleep in your room? You’ll be too tired to argue at 2 AM when all you want to do is catch a few z’s before heading out the door for another exhausting day at the office. At least this mom and dad seem totally unfazed by the child sleeping on top of them. If you’re a breastfeeding mom and you feel exhausted after a long day with your baby there’s a good chance you have accidentally co-slept with your child. This mom doesn’t seem to be in the most comfortable sleeping position but she’ll take her sleep wherever she can get it. Sometimes the best way to survive the first year or two of your child’s life is to know when you can grab some much-needed sleep. Other times you crash without realizing you are in an uncomfortable co-sleeping situation. Hopefully, mom woke up refreshed and not to sore after this accidental co-sleep. These boys are learning to sleep just like dad. They are also taking over a large part of the bed which probably explains why mom is behind the camera taking this photo. 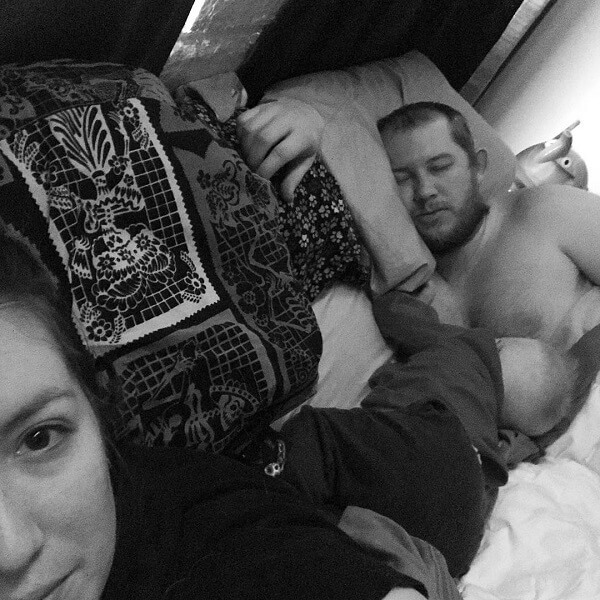 If you ever want to glimpse into the future, look back at your old baby co-sleeping photos and try to figure out if you grew up to be just like the parent you shared a bed with. At least this dad seems to be soundly sleeping while his little kiddos work their hardest to take over the master bedroom. There’s almost too much cute to handle in this photo. You’ve heard of motherly love and now we present you with smotherly love. 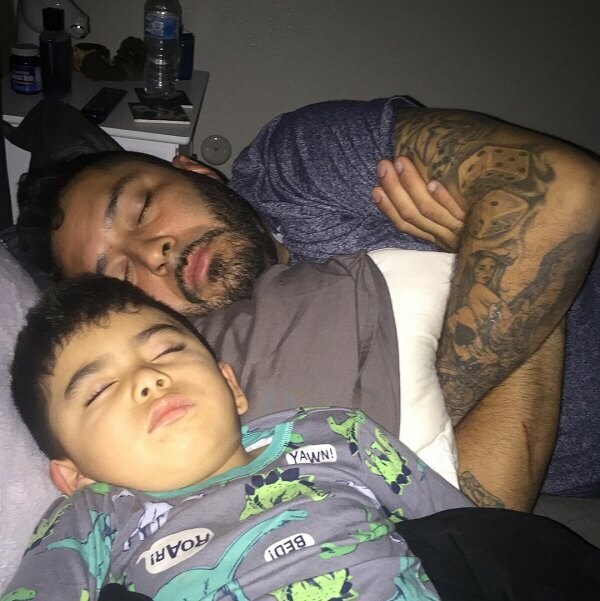 Instagram user my_peggysue captured this moment which is totally relatable to any parent who has tried to sleep in the same bed as their child. It’s hard to move because your child is just giving you snuggles but you also need to breathe. The battle for comfort, love, and sleep is waging full force when you’re a co-sleeping parent who allows a squiggly little child to share a bed. At least one family member in this relationship looks like they are enjoying a peaceful slumber. Sure this parent and child are both sleeping but don’t let this co-sleeping move fool you. Halfway through the night, there is either a very stinking toot or a poop. Either way, we predict that this parent is going to wake up in a most unpleasant manner. Even if that doesn’t occur, the chance of a leaky diaper only adds to the danger of sleeping in this reverse co-sleeping position. 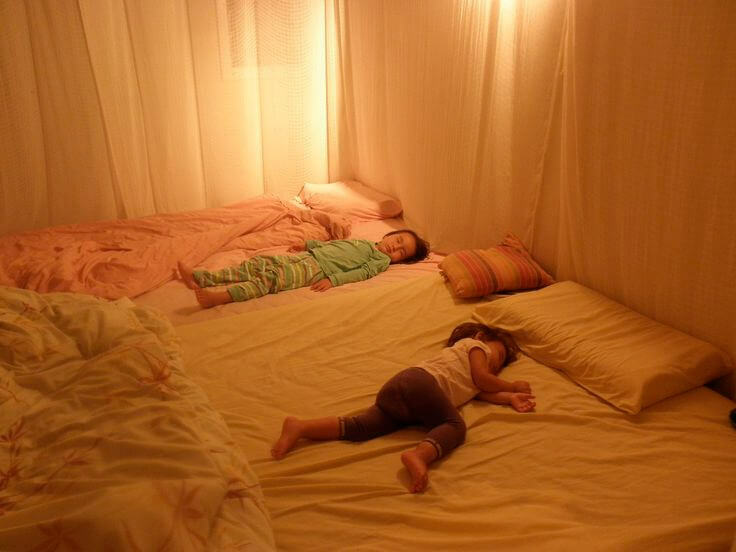 Also, kids can sleep almost anywhere and in any position if you haven’t already noticed from our list of hilarious co-sleeping fails. This dad is brave or didn’t realize what had happened. I have learned this position really well thanks to the three little children in my home. If I try to get close to my wife when co-sleeping with any of our kids I’m immediately banished to the outskirts of my mattress by my children. You might think it’s easy to just push a little child to one side but they will bring down a reckoning on you in your sleep if you attempt to make sure everyone in bed is comfortable for the night. How can such little tiny creatures so easily get their way when co-sleeping? This photo from Instagram user mikkilu313 pretty much sums up my relationship with co-sleeping. 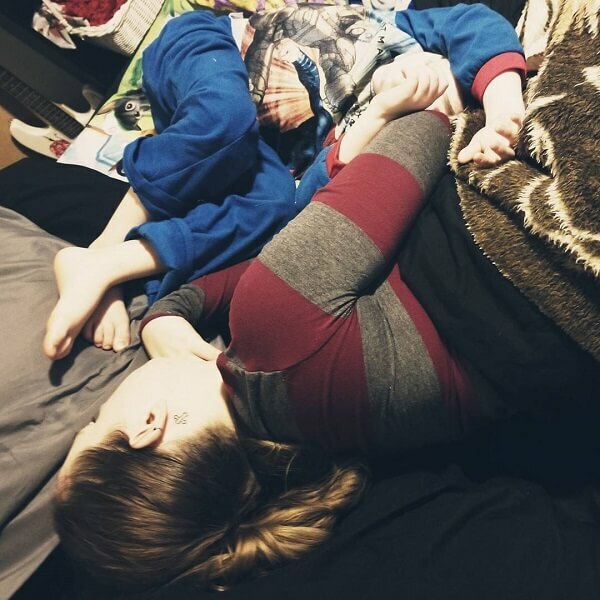 Instagram user houseofturcott posted this adorable co-sleeping moment and declared, “seriously though, every night these two make it into our bed before the sun is up lol I don’t hate it soon they’ll be too big to want to snuggle!” It’s true that our children grow up quickly and these moments matter. 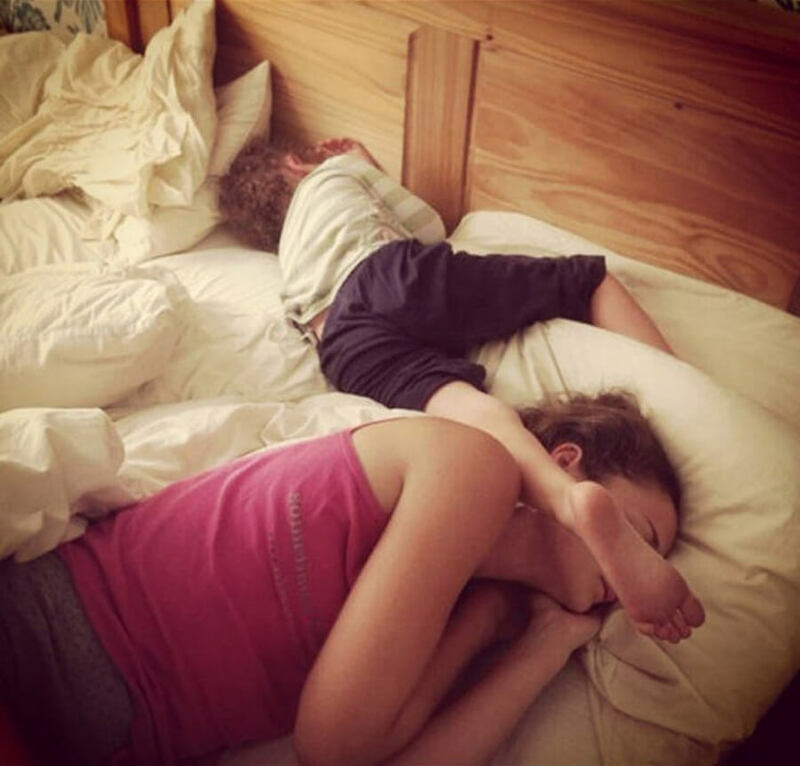 At the same time, our children have a way of pinning us into a single sleeping position when they are given the chance to team up during a co-sleeping situation. This mom isn’t going anywhere until at least one of her children wake up from their deep slumber. This little guy has trapped his mom and will use whatever means necessary to keep her close by as he sleeps. Instagram user samantha_kay19 posted this video with the message, “This right here is why we haven’t stopped cosleeping yet. Who can deny those snuggles.” This is definitely a touching moment for mother and child. 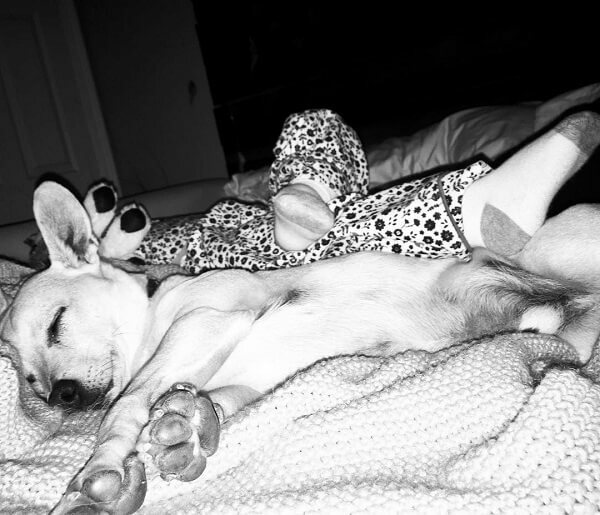 I do wonder if their entire nights are spent in such bliss or if an hour after this photo was taken her big toe was half way up mom’s noise as she slept. Even with the struggles of co-sleeping, the closeness parents feel with their children is often worth the sometimes sleepless nights. 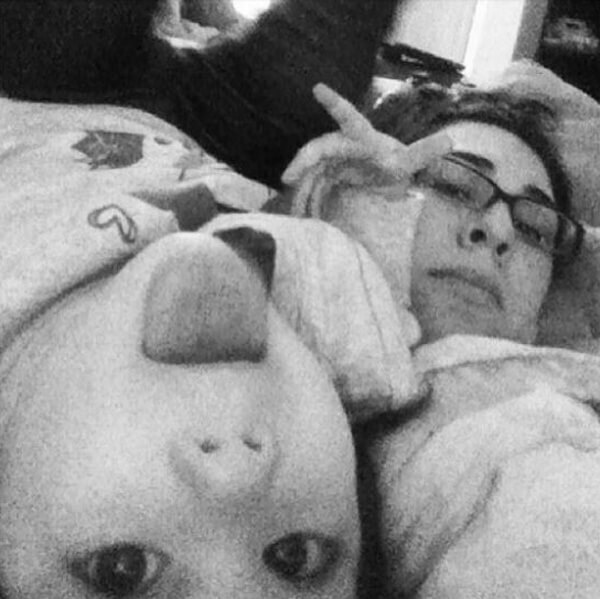 Instagram user Janeysgotagunn posted this adorable photo and said, “I always catch them in the cutest or craziest posses!” Even as our children get a little bit older the bond of co-sleeping can remain strong. It’s not just mom bonding with their children at night either. Sometimes, dad just needs a nap and their exhausted bundle of energy happens to follow suit at the same time. You’ll know when your child is too old for co-sleeping when they can physically push you out of bed while you sleep. If you’re lucky, your child will still be happily attached to you at this age, if they’re not already. This is a situation we see all too often courtesy of Instagram user shesnodelicateflower. When you have a pet that’s already used to sleeping in your bed and you have a small child, you are basically the last living thing in your house to claim a spot on the bed. On a positive note, research has found that kids who spend time near pets are less likely to develop allergies and asthma. You might not get much sleep in this situation but at least there are plenty of adorable photos that can be taken while everyone around you sleeps. 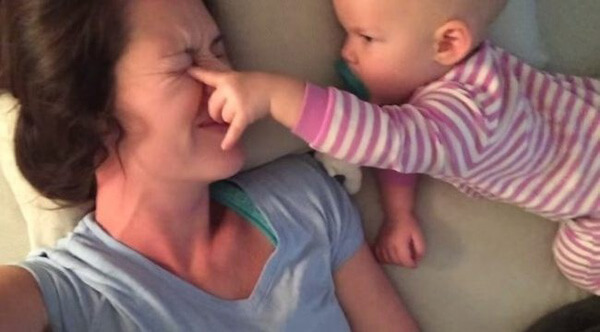 It’s easier to end up with your child’s foot in your face at night than you might think. Kids typically don’t find pillows comfortable so they don’t have a good reason to keep their head near the headboard. Even if they do use a pillow, they tend to squirm around a lot and will find new and exciting ways to wrap around mom and dad while attacking them with any appendage they have at their disposal. 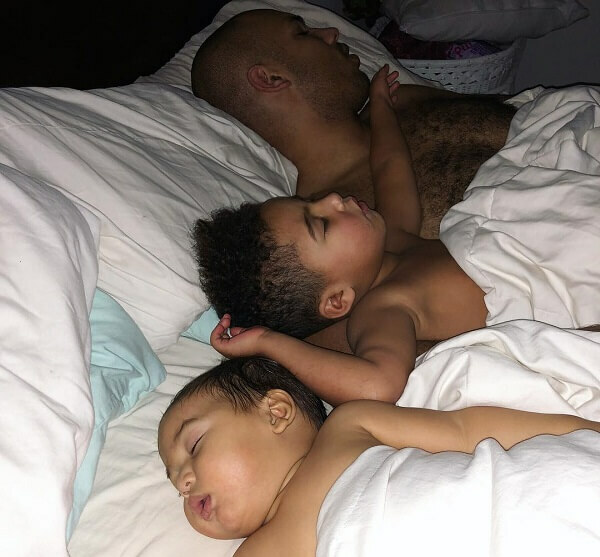 Instagram user mommalogue posted this hilarious co-sleeping picture and we’ve been there and done that on many occasions. We feel your loving pain momma. You’ll Never Get To Sleep! Again! 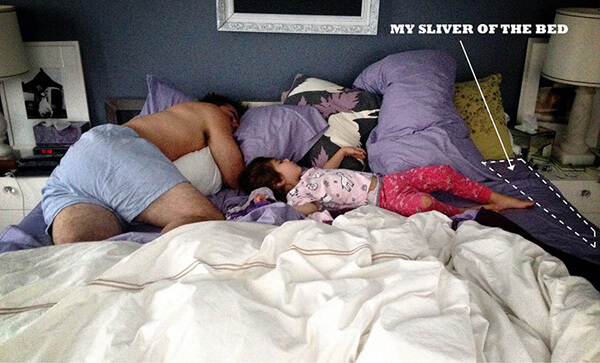 Thanks to @daniela_m_muniz on Instagram for this hilarious co-sleeping pic! 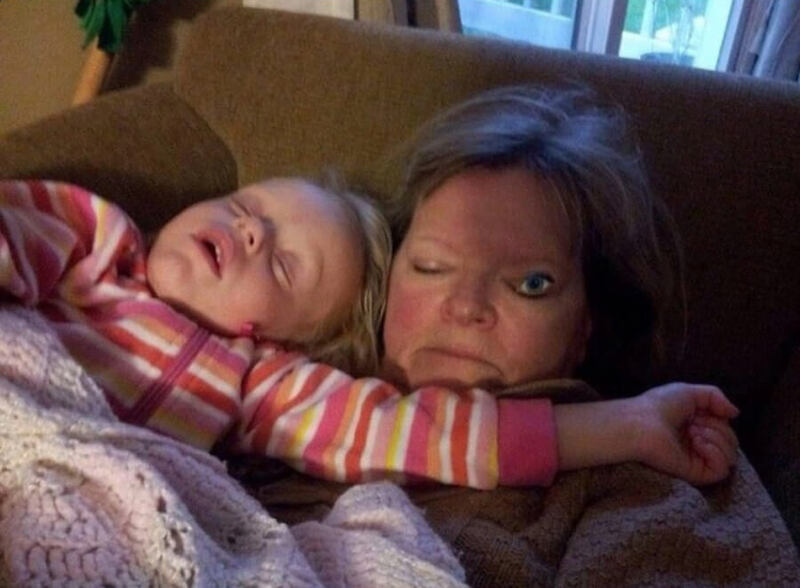 Her daughter looks like she knows exactly what she’s doing by preventing Mom from getting into sleep. Just look at her tongue sticking out as if to say, “Haha! As long as I’m awake, I’ll never let us sleep!” Kids are more cunning and sneaky than you think and this little girl is probably making it so that she’ll get out of bedtime. After all, all she wants to do is play! Maybe that’s what Mom should let her do so that she can tire herself out so hard that she’ll fall asleep In her own bed. 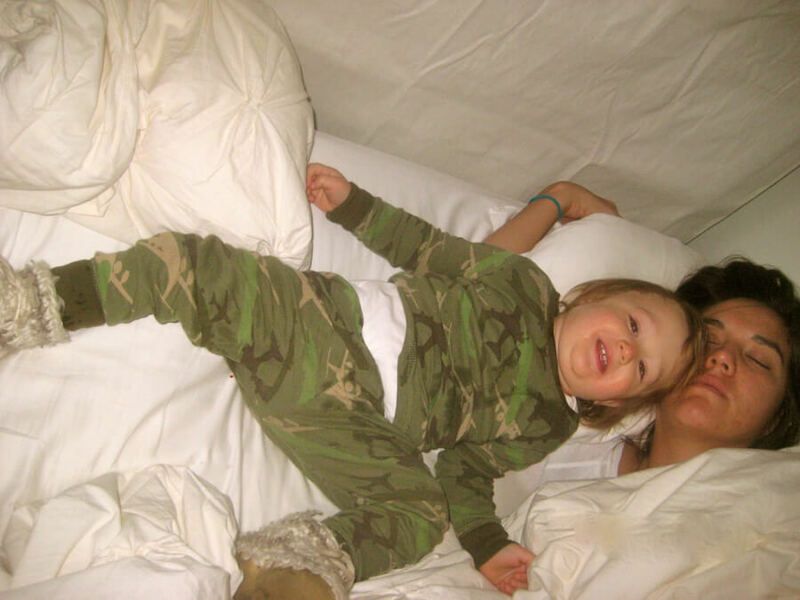 This woman writes the Mama Unabridged blog and shared her experiences with co-sleeping. When her son was six months old, she struggled to get him to sleep peacefully throughout the night. She even followed the advice of a French parenting book, that suggested “the pause,” which consists of pausing what you’re doing when you hear a sound coming from the crib to assess if the baby actually needs attention before allowing them to lull themselves to sleep. Well, this mother says that that doesn’t always work. When it doesn’t, you end up bringing baby to your own bed to fall asleep, only for them to turn around and do this. Be patient! Don’t do this if co-sleeping drives you crazy! Sometimes when kids want to sleep in your bed with you, they’ll bring along all their pals to have the best sleep over ever. Or it could be that you let your child sleep in your bed, but now your jealous pet is even more jealous because your kid is taking more attention away from them. So you let both into your bed and you wake up to what How to Be A Dad calls “The Petting Zoo.” Pets, after all, are like furry versions of children and they can get a little jealous when an actual child is in the mix. What can you do but let them feel included? When it comes to sleeping, babies take things very seriously. They don’t make compromises about how long they’re going to sleep, when they’re going to sleep, and more importantly, where they’re going to sleep. Take this little guy for example, who agreed it was definitely time to take a nap, but that didn’t mean his crib was where it was all going to go down. Nope, he wanted to co-sleep with dad, more specifically right on dad’s face. We have got to give it to this all-star dad for doing what it takes to make his young son happy. We just hope the dad eventually got some sleep too! 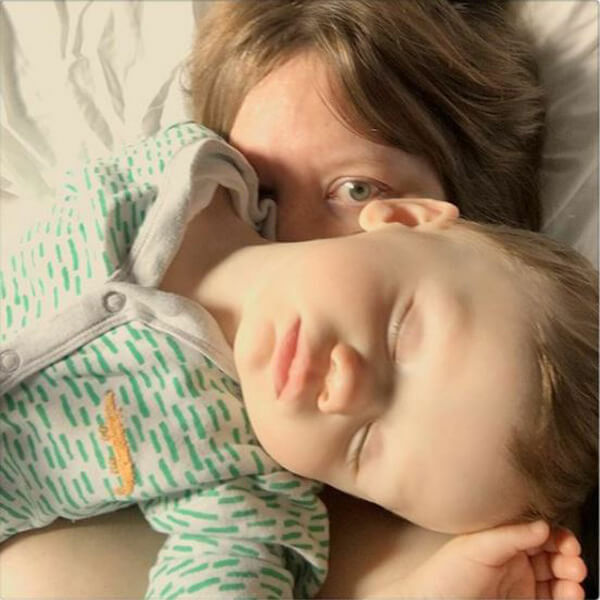 Here’s Esther Anderson of the online blog Story of This Life again sharing a video of the joys of co-sleeping with her daughter. As you can see, there is actually very little sleeping going on here. Instead, Esther’s daughter would rather start a game of Patty Cake. More specifically, she would rather start a game of Patty Cake on poor mom’s face. We hope they eventually got some sleep but we know that’s just not likely. If you found yourself scrolling through these pictures, shaking your head in agreeance with the majority of them, welcome to parenthood. 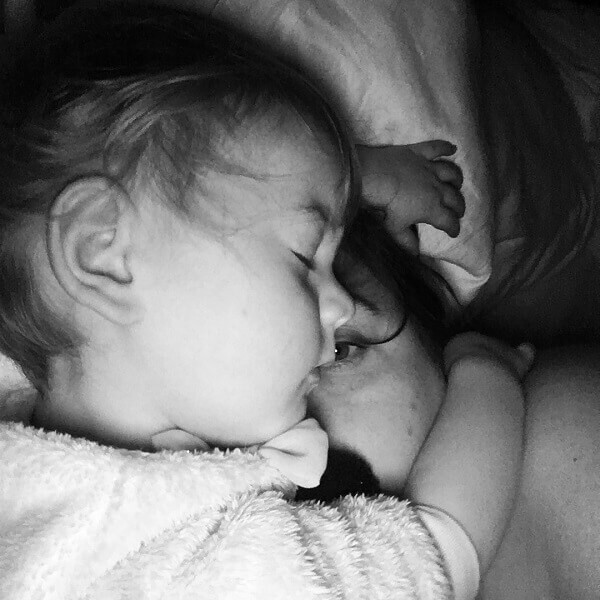 Sure, co-sleeping fails happen to the best of us, but at the end of the day, it’s all worth it to be a little closer to our babies right…? Right?! Ok, so the verdict may still be out on that one. But don’t worry. Your little ones will be grown up one day and you will finally be able to reclaim your bed and get a good night’s sleep. It’ll just take a few years!